When it comes to motivation, there is a huge gap between what science knows and what most of us do – most of us work on the motivation strategy called ‘Carrots and sticks”, may it be a job, parenting sometimes even mentoring. Daniel Pink researched and found that this current strategy carrot-and-stick is built around external/extrinsic motivation, hence doesn’t work and often does harm. Let’s take an example, would anyone of you work in the office if you are not paid salaries and bonuses? If the answer is no, what makes you work is the extrinsic motivation of money. But contrastingly, all the great inventions were done by people who were not paid anything for it. May it be Wright brothers who invented planes, Thomas Edison who invented the bulb, or Aryabhatt who invented zero. If they knew they are going to be paid for it, would they have even invented these? So what actually motivated them? Pink categorize people into two, on the basis of motivation: Type X (Extrinsic) are primarily driven by external factors, such as money, fame, status symbols etc. They can often be highly successful but can be troubled by an insatiable appetite for more and more ‘stuffs’. Type I’s (Intrinsic) motivation comes from within – to accomplish something meaningful to them. Success is measured by the task and not by an added-on reward. They have been shown to have higher self-esteem, better interpersonal relationships and greater physical and mental well-being. Type I’s will usually outperform a Type X in the long run. If we get past the simplistic ‘carrots vs sticks’ ideology, and allow people to be more motivated by autonomy – the desire to direct our own lives, Mastery – the urge to get better and better at something that matters and Purpose – the yearning to do what we do in the service of something larger than ourselves, we can leverage our potentials and maybe even change the world. And there are few companies like Google, Atlassian, and others which actually follows these principles and lets people allocate 20% of their time to personal projects. Around half of all of their products come from engineer’s personal projects. What drives these engineers? 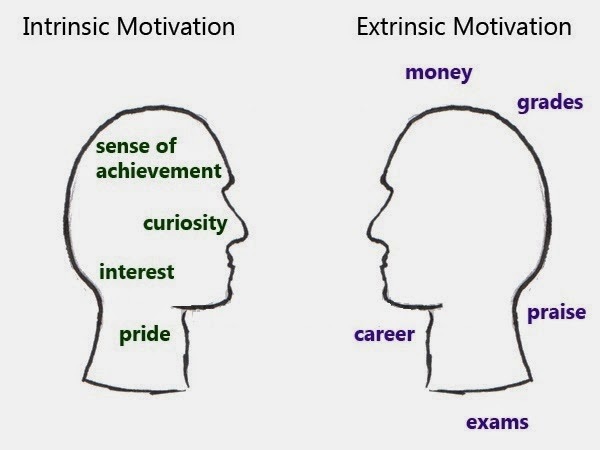 Intrinsic motivation. So, what you want to do? If you want to do the mundane repeated stuff and remain mediocre, external motivation can still help you. But if you want to change the world for a better place, you need to find and work on your internal motivation.